There is also a wedding photo from October 30, 1890 when Reverend J.W. Tims married Violet Winnifred Wood. The people in the photo are listed as : L-R back row: P.E. Stocken; Teacher Sanderson; Canon W.R. Haynes; Revered Doctor A.W.F. Cooper; Reverend Stanley Stocken; Miss Lizzie Perkes; Reverend Frank Swainson; Mrs. M. Begg; Magnus Begg; William F. Baker, farm instructor. L-R front row: Mrs. Swainson; Reverend and Mrs. J.W. Tims; Mrs. Kerby; Mrs. W.M. Baker and her two children. 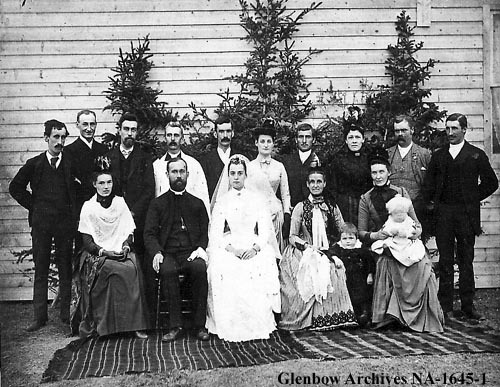 There is also a photo of the deanery meeting for the church dated 1890. None of the men in the back or middle row are identified but H.G Stocken is the far left front row, Mr. Webb is to his right and a Mr. Castle is to the far right of the front row. 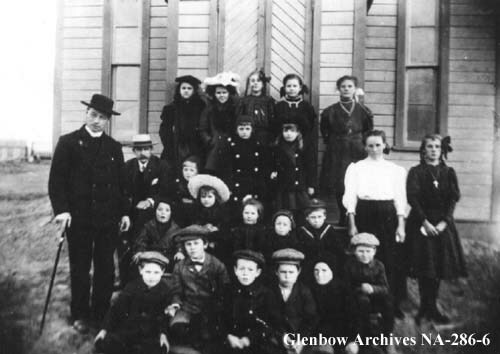 There is a 1910 photo showing the Sunday school class in front of the church. 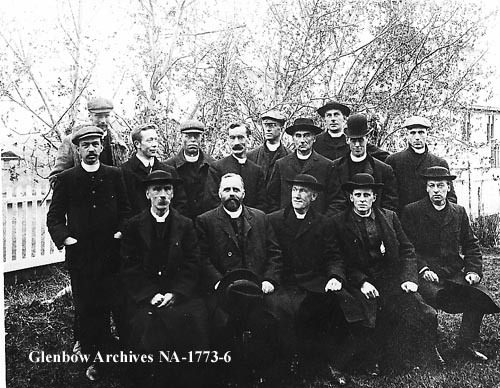 Reverend Mitten is on the far left and the only other identified individual is Walter James who is listed as the third child from the left front row. 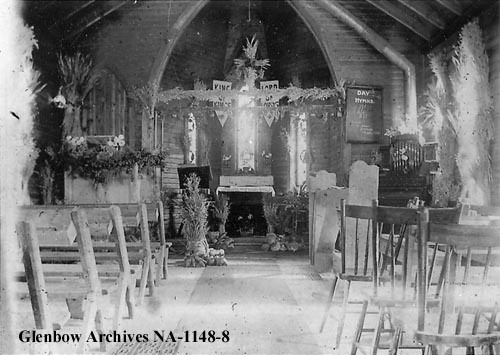 A 1909 photo shows the Church interior as decorated for the harvest festival. 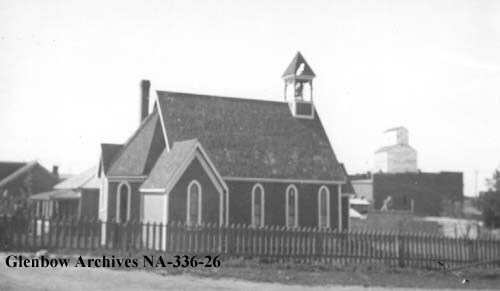 Two photos show the church in 1920 from the outside. 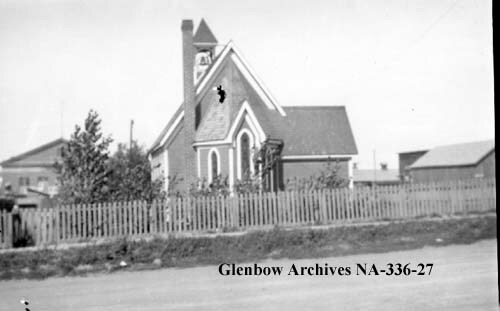 The brick chimney is the only change to the church since then, though the color of the church is now white with dark trim rather than dark with white trim. 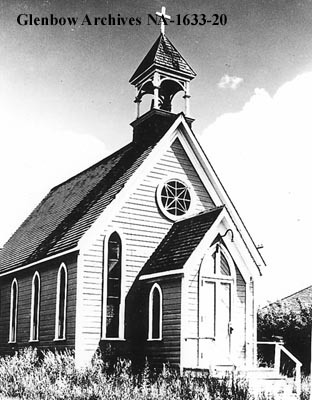 Does your church still offer Sunday services?